The oil-rich african nation of Chad has rampant corruption, unclean water, few tarred roads and patchy electricity. It ranks as the world's second most dysfunctional country, after Somalia, according to the 2011 Failed States Index of the Washington-based nonprofit Fund for Peace. In short, Chad seems a nightmare location for business  unless, that is, you are Papa Madiaw Ndiaye, 45, or Patrice Backer, 44, of Advanced Finance & Investment Group, a private-equity fund-management company in Dakar, Senegal, that has so far invested about $72 million in African financial institutions, agriculture and mining. Ndiaye, the fund's CEO and founder, and Backer, the chief operating officer, have been plotting how to get rich ever since they became best friends as freshmen at Harvard University and worked together at JPMorgan. Decades later, their most lucrative prospect last year was a bank in Chad. "It's like low-hanging fruit," says Ndiaye, describing the investment climate in Africa. "There is no competition. If you know what you're doing, it is a bonanza." Such bonanzas  opportunities in troubled places with huge needs  are increasingly being sought out by a fast-growing group: Africans who have returned home after years of living, working and studying in the West. Though still a small subculture, African executives who have abandoned high-flying careers on Wall Street, in the City of London and in other financial hubs are becoming a force across the continent, their impact far outstripping their numbers. By moving home, they and others are bucking the trend of generations of Africans who headed west in search of brighter prospects, better education and decent jobs  and stayed abroad for good. Millions of African families have been kept afloat for decades by remittances from relatives working abroad as everything from street cleaners to physicians. Now with economic prospects and, in some cases, political stability improving in Africa while both are declining in the West, some of those relatives have concluded they are better off back home. "There is a momentum among young, upwardly mobile people to come home," says Rolake Akinola, a Nigerian business analyst with years of work experience in London. "We call ourselves the Repatriate Generation." The generation is a product of two colliding forces. The first is the global economic crisis of 2008, which resulted in millions of lost jobs in the U.S. and Europe and dampened employment prospects even for the best and the brightest. The other is the rocketing value of commodities, many of which are found in Africa. This has drawn new investment to the continent and pushed up growth. The upturn has been helped by deregulation in several countries, which has opened new industries to private investment, and also negotiations to end violent conflicts in places like Liberia and Rwanda. A report last year by McKinsey & Co. found that Africa's annual growth rate averaged 4.9% from 2000 to 2008  more than twice the pace in the 1980s and '90s  and was likely to continue for some time as its middle class grows. Consumer spending on the continent could reach $1.4 trillion by 2020, the report claims. "If recent trends continue, Africa will play an increasingly important role in the global economy," it notes. Companies trying to crack these markets are scrambling for local expertise. That has set off a recruiting frenzy for talented Africans, particularly those with work experience in the West. "Every time we have a good person working for us, they get a lot of job offers from other companies trying to lure them away," says Patrick Dupoux, a managing director at the Boston Consulting Group who last year opened the company's first Africa office, in Casablanca. He says BCG is bringing several Africans from Europe and the U.S. to the continent, some of whom are in their late 20s and fear that their careers would inevitably "hit a glass ceiling" in the West. By contrast, he says, "most people here think they can make it to the top, and it is really feasible for them to do so." Solomon Asamoah, 47, a Ghanaian whose family moved to Britain when he was 4, certainly believes it. 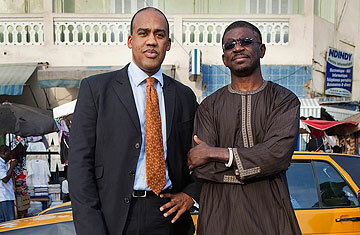 Asamoah worked for HSBC in London for years before joining the World Bank in Washington, where he befriended Ndiaye. The two began riffing about future dream projects, including building businesses that could modernize Africa, but never really believed that their dreams would come to pass. In 2007, Asamoah finally moved to Lagos, Nigeria, where he became chief investment officer for Africa Finance Corp., a locally based investment company focused on Africa's dire infrastructure needs like power plants, roads and rail lines. To Asamoah, the grueling aspects of living in Africa  like powering his home in Lagos with a diesel generator  are clues to how much money can be made there. Nigeria's new President, Goodluck Jonathan, has made providing electricity for Nigeria's 135 million people his top priority, sparking intense competition for contracts among hundreds of power companies. "Companies are salivating at coming in," says Asamoah, whose firm invests in companies developing infrastructure. "Even without power, Nigeria is growing at 7% a year," he says. "Can you imagine what will happen when most of the country has electricity?" See pictures of the famous diamond empire in Africa.